I had a chat with Ruth and Jenny, the lovely owners of Ammonite Yarns in Pontyclun, and they agreed to host a Crafternoon on their premises on 22 September from 2 till 5. Our big plan was to have some general knitting and crochet as well as kid-friendly weaving and braiding going on in the shop itself while we would take it in turns to run mini-workshops in the back room every half hour. 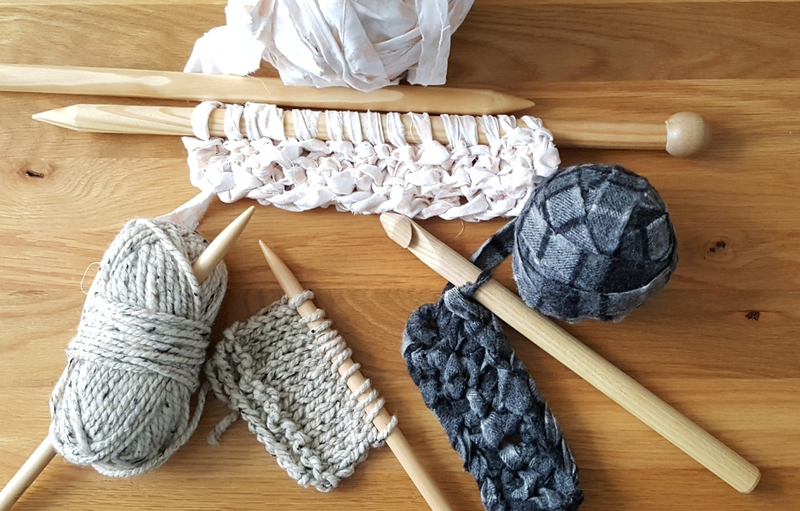 There was going to be double-sided knitting, spinning, broomstick lace crochet, Dorset buttons, weaving on a peg loom, as well as wet felting and needle felting (courtesy of resident expert Eva). There was a lot of prep involved in the run up to the event, with lots of knitting and crochet samples to make up in all sorts of sizes (I had to make some extra thick T-shirt yarn to showcase my 20 mm needles and hook). I also had to come up with a more convenient implement than an actual broomstick for the broomstick lace workshop (it turns out that a 15 mm crochet hook stuck in a sturdy ball of yarn so that it stays upright on the table is a very good solution; a marker pen will also do the trick). On the morning of the big day, I was teaching a beginners workshop (how to go from zero crochet experience to making granny squares), then after a brief lunch break, people started to arrive for our Crafternoon. By that point, things had already started going a bit pear-shaped: Ruth’s childcare plans had fallen through so she had to go and pick up her son from somewhere and take him somewhere else (so we had to swap a couple of workshops in the schedule); Jenny’s daughter was doing some IT maintenance on the shop’s computer in the back room and the machine was still churning data at 2 o’clock. Finally, at about 2:10 we got people in the back room to get started on the broomstick lace workshop. 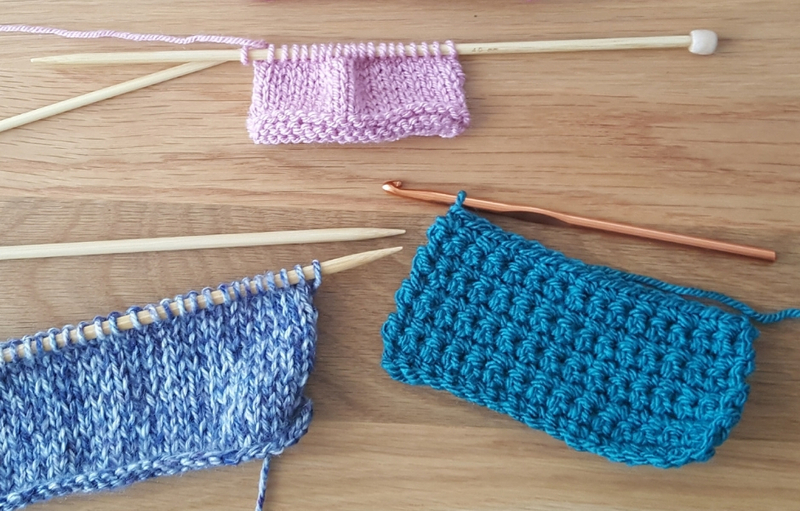 Initially, there were only about six people and I felt confident that I could teach them how to do broomstick lace, even though a couple of them had no crochet experience to speak of. But then more people turned up, including a young girl and her mother, and they had never crocheted, so that was a bit more of a challenge: I love teaching complete novices how to crochet, but the circumstances were not quite right – unlike my classes for beginners, it was a crowded, busy, noisy environment, with other people waiting for me to show them the next step, which stressed me out big time! I must say a big THANK YOU to all the attendees of that workshop for their patience with me as I got a bit flustered. Extra special thanks go to the more experienced crocheters who helped the newbies when I was busy with somebody else – you are the unsung heroes of the day. My workshop was supposed to run from 2 o’clock until 2:30 and there was supposed to be a different one at 2:30, but we only started at 2:10 and we didn’t leave the room until way past 3 o’clock. However, nobody complained and the whole atmosphere remained very happy and jolly all afternoon. The rest of the Crafternoon is a bit of a blur if I’m honest. Some people stayed in the back room almost all afternoon, as they fancied all the workshops (the schedule was all over the place by that point, so the number of workshops was reduced). Ruth did a wet felting demo in the kitchen and Eva taught needle felting in the back room; Jenny then ran a very well attended (standing room only!) 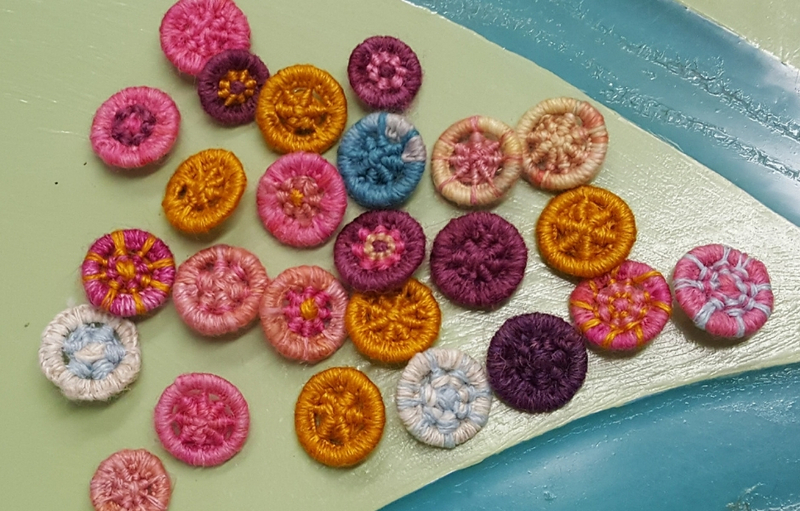 workshop on Dorset buttons. In the end, the peg loom only made a brief appearance in the shop, while the knitting workshop didn’t happen at all. 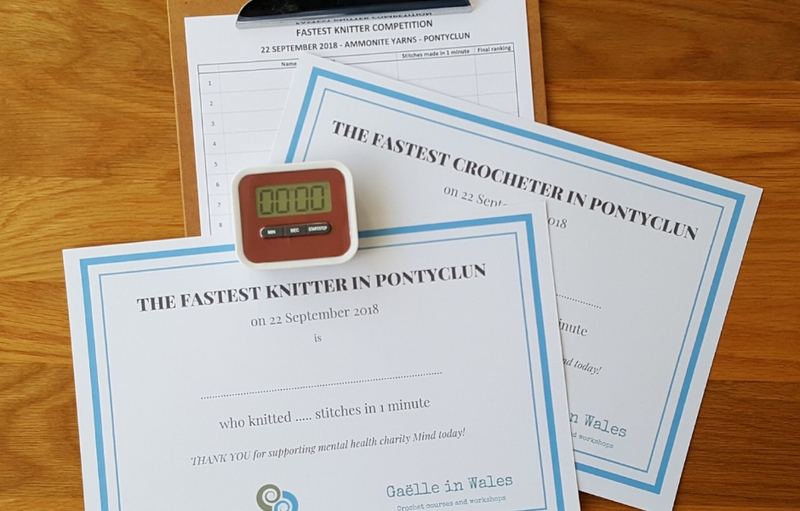 We had also organised a fastest knitter/crocheter competition: how many stitches could everyone make in just one minute? Ruth, Jenny and I timed ourselves knitting and crocheting for a minute but did not officially enter the competition. Ammonite Yarns regular Gwyneth ended up being the winner in both categories, with 48 knitted stitches and 27 double crochet stitches in a minute – pretty impressive! But the important number is not how long it took me to recover, it’s how much money did we raise? We raised £108.41, which is a great result given that we were recommending each person’s donation to be about £5 and at one point Jenny’s husband counted 19 attendees. 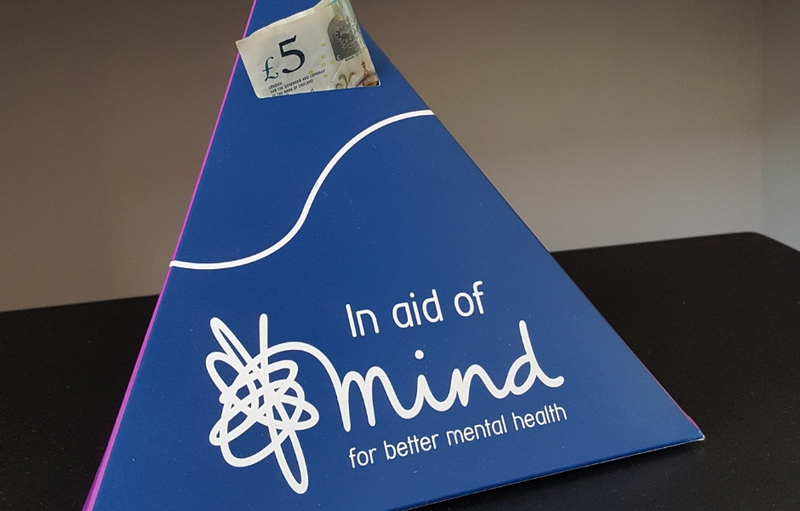 We had received a couple of donations before the event from people who wished to support it but could not attend and I am still receiving extra donations, so I will be sending at least £120 to Mind next week. Will we run a similar event again? We haven’t decided yet, but I think in many ways this Crafternoon was a good practice run for potentially bigger events, as we have learnt a couple of lessons about the number of people that could fit in the building and the scheduling of the workshops. Thanks again to everyone who helped with and attended this Crafternoon. 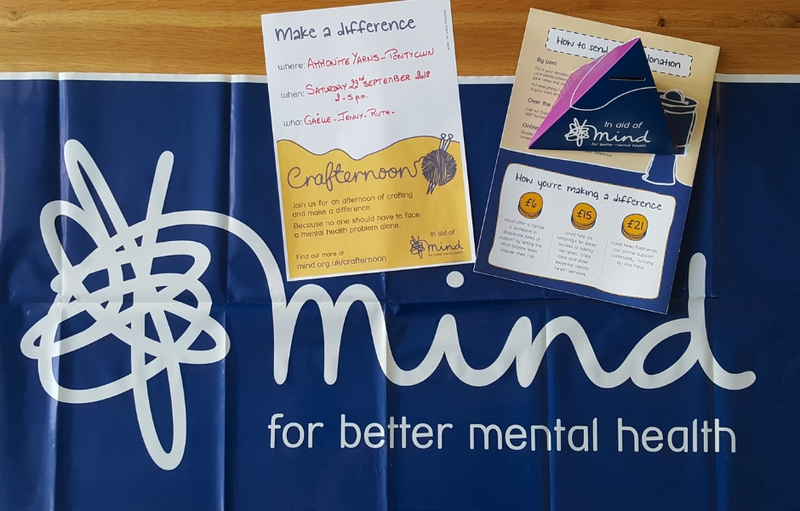 If you’d like to organise your own, check out the Mind Crafternoon webpage.